Reviewed by Patrick Fessenbecker on 2010-11-29. The figure of George Eliot has been a topic of some fascination to biographers. It is easy to see why: in her relationship with George Henry Lewes, her translations of dense works of philosophy, and not least her justifiably famous novels, she appears as a social revolutionary, a noted intellectual, and perhaps above all as a great artist. 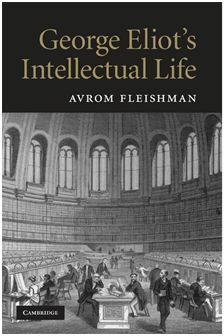 In the present book, Avrom Fleishmann sheds new light on Eliot. By focusing carefully on the history of her reading -- rather than on generalizations about the intellectual movements of her day, or on her personal relationships -- he generates a provocative series of readings of her works. In his approach to Eliot, Fleishman challenges the tradition initiated by Gordon S. Haight, whose George Eliot: A Biography (1968) set the standard for subsequent Eliot biographies, and whose edition of Eliot's letters remains the primary critical source for such lives. Despite this compilation of "copious data on her activities and writings," however, Haight's biography fails -- in Fleishman's estimate -- to achieve an "integrated account of intellectual activities and creative production" (2). By this, I take it, Fleishman means that biographers such as Haight have failed to see with sufficient clarity how Eliot's wide-ranging intellectual engagements informed the making of her fiction. Besides critiquing the work of Haight, Fleishman faults more specific studies of of Eliot's intellectual history such as Valerie Dodd's George Eliot: An Intellectual Life (1990), William Myers's The Teaching of George Eliot (1984), and Michael Wolff's unpublished dissertation, "Marian Evans to George Eliot: the Moral and Intellectual Foundations of Her Career" (1958). Such studies, he contends, invariably engage in "summation," presenting a refined and systematized thinker called "George Eliot" rather than tracking the progression of her ideas throughout her life (x). In tracking this progression himself, Fleishman declines to situate Eliot within any particular intellectual movement. Noting, for instance, that Myers cavalierly classifies her as a "Positivist" (capital P and all), Fleishman remarks, "This would have surprised Eliot's friends among the leaders of the English Positivist society, who kept urging her to join" (65). By contrast, he compliments Diana Postlethwaite's Making It Whole: A Victorian Circle and the Shape of Their World (1984) by noting that she eschews "the usual formula for intellectual influence -- thinker X directly influenced writer Y -- by ranging through an entire intellectual milieu, the true unit of almost all worthwhile inquiry" (17). More often, however, Fleishman's own way of eschewing intellectual labels becomes apparent in the details of his argument, as in his repeated assertion that Eliot "goes beyond" her sources (82, 242). Insofar as Fleishman does consider intellectual influence, I take him to be asserting the importance of John Stuart Mill for Eliot's thought, and to be arguing against analyses that emphasize the relevance of Auguste Comte. Compared with Comte, Fleishman argues, "Mill came first and most consistently to [Eliot's] mind; she read his major works throughout her life, in more or less the order of their appearance" (59). Conversely, while admitting "there is no reason to censure the inclusion of Comte in any large estimate of Eliot's mental structure," Fleishman points out that it would be difficult to prove that she read much of Comte's central work, the six volume Cours de philosophie positive. More importantly, he notes, her views diverge from Comte's in important ways. In one sublime sentence she rejects Comte's notion of a utopia led by the philosophical elite. "It has yet to be shown," she writes, "that the human being modified into a philosopher -- still more a vast body of men so modified -- will be exempt from the temptations or warping influence which have hitherto made corporations disposed to amplify their power even to tyranny" (qtd. 64). Fleishman opens his book with four introductory chapters on Eliot's intellectual background. The first two describe, respectively, her grounding in the "Evangelical" movement of Anglican Christianity as a youth and her subsequent rejection of the Christian religion -- a move influenced by her translation of David Friedrich Strauss' The Life of Jesus, Critically Examined (1846), a central text in the German "higher criticism" of the Bible. The next two chapters treat her response to other influences. Chapter 3 examines her encounters with the thought of Mill, Comte, Spencer, and others as de facto editor of the Westminster Review; Chapter 4 assesses her reception of German philosophy more generally, particularly the thought of Wilhelm Heinrich von Riehl. Five subsequent chapters go on to explain how her fictional works express her mature thought. Fleishman's method is to take a particular work and situate a reading of it within an appropriate intellectual context. Thus he reads Romola and The Spanish Gypsy against Eliot's notions of history and historiography, while The Impressions of Theophrastus Such exemplifies -- for him -- Eliot's incarnation as a cultural critic. Though each of his chapters stands largely alone, a few arguments inform the book as a whole. After contending early on that "George Eliot...was the first tragic novelist" (9), Fleishman repeatedly treats her novels as tragedies, arguing that Eliot's "tragic sense of life" sprang from her belief in the inevitable tendency of human beings to act in stupidly egoistic ways despite the possibility of genuine progress (56). In Fleishman's readings of Eliot's fiction, "tragic" is invariably a key term. The Mill on the Floss centers around a "tragic process, the grinding down of a potentially cultivated and creative young woman" (107); Romola depicts a "tragic opposition" between "the purity and simplicity of high ideals" and "the stern demands of reality" (128); to achieve a "global estimation" of Middlemarch, we must apply "the tragic mode" as a literary category (186). On the whole, Fleishman concludes, Eliot was a "tragic humanist" (251). This steady emphasis on Eliot's tragic strain, however, is unaccompanied by any ongoing explanation of its link to her intellectual history. And since the ongoing project of the book is just this intellectual history, the overall effect is to leave Fleishman's analysis of Eliot's "tragic sense" somewhat unclear. In the chapters on her novels, Fleishman tends to start at some point in her intellectual history, argue his way to claiming that tragedy is a key to understanding a given novel, and then repeat the process in the subsequent chapter. We are thus left to wonder what links Eliot's notion of tragedy to the rest of her intellectual life, and -- since it recurs again and again, without ever becoming the central topic of analysis -- why exactly tragedy is so significant for understanding Eliot. Though Fleishman at one point mentions Hegel's concept of tragedy, it is largely to argue that Eliot probably didn't read Hegel directly (82). And lest we think that Fleishman is inappropriately rejecting Shuttleworth, he works elsewhere to demonstrate what we might call Eliot's scientific "realism," in large part inherited from Mill (68). It is hard to see what Fleishmann means here. Since he doesn't unpack Eliot's complex passage, we cannot tell just what he means by "these things," the things he finds expressed by it. More problematically, while he rightly construes the passage as claiming at least that moral judgments cannot be made in the abstract and instead require situation-specific information, he scarcely persuades us that this point comes to Eliot from Mill. Consider Fleishman's evidence. First he cites a passage from A System of Logic in which Mill describes the "error" of deducing "the line of conduct proper to particular cases, from supposed universal practical maxims" (A System of Logic  591, qtd. 54). Second, recalling Mill's disagreement with Jeremy Bentham's simple pleasure calculus, he argues that the novel in part "reads like a formal debate between the hedonist version of Utilitarianism and Mill's refined and humanistic version" (55). But Fleishman stretches the evidence. It's true that Mill criticized French political scientists for applying abstract principles to specific situations, and it's also true that he disagreed with Bentham because he thought happiness was based on something more than pleasure. But neither of these points commits Mill to believing, as Fleishman infers, that individual moral deliberation should not involve appeals to abstract principles, especially the principle of greatest happiness. This is not only an unjustified inference; it actually misrepresents Mill's view. [I]t can hardly be pretended that anyone will be the less qualified for dealing with [cases of conflicting obligation], from possessing an ultimate standard to which conflicting rights and duties can be referred. If utility is the ultimate source of moral obligations, utility may be invoked to decide between them when their demands are incompatible. Though the application of the standard may be difficult, it is better than none at all; while in other systems, the moral laws all claiming independent authority, there is no common umpire entitled to interfere between them...[they thus] afford a free scope for the action of personal desires and partialities (Utilitarianism 36-37). Here Mill argues for precisely what Fleishman says he doesn't: namely, the importance of applying abstract principles to difficult and complex situations. Taking such principles as essential in resolving the complexities of competing obligations, Mill rejects the situation-specific judgment championed by Eliot because such moral judgments invariably lack a "common umpire" capable of arbitration. Secondly, when Fleishman links Mill with the argument that moral judgments cannot be abstracted and must be situation-specific, he ignores the fact that neo-Aristotelians have criticized Mill for arguing precisely the opposite. "A standard objection" to utilitarianism, writes Rosalind Hursthouse, "is that it misrepresents the texture of our moral experience, making it out to be much simpler than it really is" (On Virtue Ethics 55). Refusing to think that moral judgment can be captured in a single principle, neo-Aristotelians have instead contended that ethical decision-making requires a certain sensitivity, which consists in "recognizing what the morally salient features of a particular situation are, applying certain rules rather than others," and "weighing and balancing competing considerations correctly" (On Virtue Ethics 54). This sensitivity, which Aristotle called "phronesis" or practical wisdom, cannot be articulated or distilled into general principles, but is instead the product of a lengthy moral education. Consequently, in the passage that critiques the men of maxims, I believe that the narrator is diverging from Mill rather than reflecting his influence. While Fleishman might respond by claiming that Mill himself was a neo-Aristotelian, this would require a good deal of argument. More generally, I confess myself surprised that none of Fleishman's chapters bears the heading "philosopher." In avoiding this term, he seems not only to understate the depth and sophistication of Eliot's ethical thought, but also to ignore the fact that the intellectual questions he raises generally fall within the realm of "moral philosophy." Since his chapter titles already designate a variety of intellectual concepts, he might well have analyzed one of Eliot's novels under the heading of "philosophy" or "philosopher." In addition, the structure of the book prevents Fleishman from pursuing an idea through more than one text. He fails to recognize that Eliot returned again and again to the same intellectual problems, addressing them in slightly different ways. The "men of maxims" passage, for instance, echoes a sentence from "The Natural History of German Life", where Eliot remarks: "If we need a true conception of the popular character to guide our sympathies rightly, we need it equally to check our theories, and direct us in their application" (Essays 272). And in a famous passage on Bulstrode's rationalizations in Chapter 61 of Middlemarch, the narrator declares: "There is no general doctrine which is not capable of eating out our morality if unchecked by the deep-seated habit of direct fellow-feeling with individual fellow-men" (Norton Critical Edition, 668). In shifting from "theories" to "general doctrine," the passages reveal suggestive differences. But the structure of Fleishman's analysis, which privileges analysis of a single text over analyses of similar ideas from differing texts, prevents him from considering such texts as variations on a continuing theme. This problem leads to my final objection, which involves Fleishman's way of writing Eliot's intellectual biography. In his Preface, Fleishman tells us first that "Eliot's novels will be considered here not as works of art but as moments for the emergence of ideas" (ix). He then goes on to distinguish three ways of interpreting "ideas in fiction": the insertive approach, which takes the intellectual biography of authors and finds their ideas in their texts; the extractive approach, which goes the other way by finding ideas in texts and claiming that the authors believed them; and finally the "functional approach," which considers "how an idea works in the course of a novel or poem (ix-x). At first, I understood Fleishman to mean that he would be considering Eliot as an intellectual instead of considering her as an artist: he would be reading the texts purely for their ideas and the way they were developed. But as the book progressed, it became clear that Fleishman aimed for something else: in his "functional approach," he tries to show how the ideas in a text generate its aesthetic structure. His chapter on Middlemarch, for instance, starts by analyzing Eliot's essay "Notes on Form in Art," and then examines her reading of scientific and social-scientific literature. Rather than showing what Eliot's ideas contribute to science, however, he shows how they can help us understand the structure of the novel: "it is not only the individual characters who are organisms," he writes, "but their plot relationships as well, and these plots are related to each other organically, so as to form the super-organic whole that is the novel" (177). For this reason, Fleishman's own definition of the "functional approach" in the Preface seems to me misleading. Rather than simply identifying the ideas expressed by Eliot's novels without regard to the artistry of her fiction, he shows how her ideas help to shape that artistry. Nevertheless, I cannot help but think that this approach leaves a promising road untaken. In his preface, Fleishman promised to treat Eliot as an intellectual tout court, rather than as an intellectual artist. But his book stops short of fulfilling this promise, which strikes me as regrettable. We have not yet fully grasped what Eliot's intellectual views were, and one reason for this failure is the insistence on treating Eliot as an artist and an intellectual simultaneously. We need a biography focused solely on her intellectual life. By seeking only to explain Eliot's thought rather than showing how it affected her aesthetic practice, such a biography would offer a powerful resource for literary critics. So a strictly philosophical account of Eliot's intellectual life remains to be written. But in its refusal to follow the pattern of broad-stroke intellectual history, in its dedication to careful analysis and close, text-based readings, and in its provocative suggestion of a distinction between novels as intellectual expressions and as art, this book is a welcome step along the path. Patrick Fessenbecker is a graduate student in English at The Johns Hopkins University. He is the author of two forthcoming articles: "Jane Austen on Love and Pedagogical Power" in Studies in English Literature and "Freedom, Self-Obligation, and Selfhood in Henry James," in Nineteenth-Century Literature. Men can do nothing without the make-believe of a beginning. Even Science, the strict measurer, is obliged to start with a make-believe unit, and must fix on a point in the stars' unceasing journey when his sidereal clock shall pretend that time is Nought. The great problem of the shifting relation between passion and duty is clear to no man who is capable of apprehending it; the question whether the moment has come in which a man has fallen below the possibility of a renunciation that will carry any efficacy, and must accept the sway of a passion against which he had struggled as a trespass, is one for which we have no master-key that will fit all cases. The casuists have become a byword of reproach; but their perverted spirit of minute discrimination was the shadow of a truth to which eyes and hearts are too often fatally sealed,--the truth, that moral judgments must remain false and hollow, unless they are checked and enlightened by a perpetual reference to the special circumstances that mark the individual lot. All people of broad, strong sense have an instinctive repugnance to the men of maxims; because such people early discern that the mysterious complexity of our life is not to be embraced by maxims, and that to lace ourselves up in formulas of that sort is to repress all the divine promptings and inspirations that spring from growing insight and sympathy. And the man of maxims is the popular representative of the minds that are guided in their moral judgment solely by general rules, thinking that these will lead them to justice by a ready-made patent method, without the trouble of exerting patience, discrimination, impartiality,--without any care to assure themselves whether they have the insight that comes from a hardly earned estimate of temptation, or from a life vivid and intense enough to have created a wide fellow-feeling with all that is human. Leave a comment on Patrick Fessenbecker's review.